Appearance: With a down the center pour I got a fluffy three-finger head that that slowly descended into rocky peaks of beautiful hoppy foam. Lacing was excellent. Color was a golden amber with soft yellow highlights. Smell: Piney hops take the forefront of what is a somewhat resinous scent. Some floral notes are also present. Very nice hoppy smell. No question as to its breed of beer. Caramel malt sweetness on the finish. Initial Taste: Soft malts take the lead with a biscuit-like sweetness. A mild piney, floral hop bitterness comes through to cut down the sweet malt. Not as much as the smell would forecast however. The piney resin found in the scent doesn’t really make a big appearance. It’s more of a subdued hop bitterness that finishes with a slightly sweet dryness that sets you up nicely for the next sip. Thoughts: Ok, so anyone that drinks beer knows who Samuel Adams is. 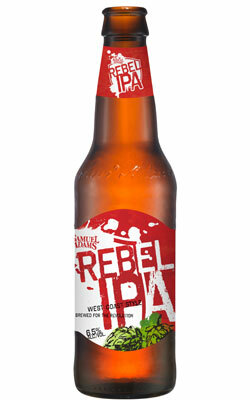 So it’s no surprise that these guys decided to take a crack at the famous West Coast style IPA. Which simply means a hop bomb of an IPA. Focusing more on the hop flavor than the malt creating an unbalanced hop forward IPA. So how did they do with this one? Well Samuel Adams is known for making a beer that appeals to the masses (Boston Lager anyone?). And this feels right along those lines. I think this beer is more of an intro to West Coast IPA rather than a good example of the style. But don’t take that as a slam against the beer. It’s a good little IPA. And compared to their other IPAs it’s fantastic. However, prepare yourself for a watered down version of what is a very hoppy style of beer. However, for a new beer drinker who likes hops and is looking to branch out …this is your beer. It smells great, has a good malt profile and is decently hopped. Great for a beginner or even a hop head like myself who is looking for an easy beer to drink. But don’t just take my word for it. Go out and try it and let us know what you thought! Cheers!